Will, mastery, organizational skills, creative talents. Ability to turn ideas into reality. Self conscious phase of personal mental activity. Mercury and the mind rules here. The Magus is the channel between the infinite and the human realm. "Bet" means "house" in Hebrew, and is the protected space of the individual mind. "B" is a contained sound, first developing in a space enclosed by lips and mouth, an internal activity, and so also, the symbol of "house." The letters jumped from the crown of the Creator, starting with Tav, pleading to be the first letter said. Every letter has a shortcoming, disqualifying it, until Bet, the first letter of "BeRESHeet," (in the beginning), the first word in the Bible. Aleph was left behind, so God compensated by making Aleph the first letter of the alphabet, and of the 10 commandments. Bet is a "Double Letter," with two sounds. The word above is "At the Beginning" - "vuh-RAY-shees" - the first word in the Torah (Bible). (Rosh, or resh, [Key 19] means "head;" same as "beginning;" "vuh" means "at.") "Genesis" is a Greek word used for the same book that Jews call Bereishis. "Bet" is also the first letter of "Barukh" - the first word in a Jewish brakha, or prayer. Translated as "blessed," it is primarily praise, and an expression of awe and gratitude for the Creator, to whom the prayer is addressed. "BRKH", is a verb that means "to bend the knee," or "to praise, adore, to bless," and is used by the prophet Isaiah: "Every knee will bend" (Isaiah 45:23). One interpretation has it that this also means that the Creator, with infinite Mercy/Chesed, is on bended knee, in order to bestow glory on Earth's creatures below. It is useful to see the aleph-beyt as a Hebrew tale of creation, beginning with Aleph and ending with Tav. In this scheme, Bet is the contraction of Tzimtzum, coming after Aleph, the undifferentiated infinite. Bet is the other, generated from within the Infinite - Creator making boundaries within itself so that difference becomes possible. From primal unity in Aleph, springs olam ha'pirud - the "World of Distinctions," or "World of Separations." Bet is a housing for the divine energy, the form necessary for the unfolding of creative potential. Every particle of creation is a bet of God. Aleph becomes Bet - God becomes World. The gematria of Aleph is one, and that of Bet is two, again pointing to the differentiation process - the unity creating other out of itself - from one to two. The arbor over the Magician is another house, one of the simplest kind. This house is conceptual, and thus "portable," in a similar sense as the portable "body house" of Key7. The rose arbor is the succah, a temporary house built during the week-long Feast of Tabernacles, to remind us of how fragile our security really is, and to keep us in touch with the moon, stars, and wind. The flimsy walls and roof of the sukkah are like the permeable membrane between our consciousness and the Infinite, restoring our connection to the outside world, it's danger, beauty, and comfort. Tradition has the nightly meal in the succah, with guests both real and imaginary. Friends visit, and each night has a prominent Biblical personality in memorial attendance. Sepher Yetzirah says that "Bet" reigns in wisdom. Thoth, Hermes, and Hanuman are compared. This path is called "Transparent Intelligence," resonating with Hod. This "transparency" is also a reference to "transmission" from the spiritual realm to the material, like a window pane, powerful and clear. The alchemical characterization of Bet/Mercury is that of a flowing, shifting, unstable principle, always adapting and changing. This flightiness explains the monkey who attends Thoth, and Hanuman, the monkey god. This "Tossing of the mind" is called Vikshepa, discussed in Key 6, and Gemini, ruled by Mercury. 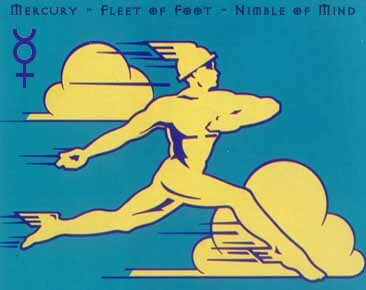 Mercury is the Quicksilver Messenger; his winged helmet and sandals transmit thought with dispatch. He is a sharp, sparkling, quick wit. The number "one" refers to concentration, attention, and focusing the field of activity. Key 1 is the first of the first seven, commencing the powers or potencies. Role of the son, ways in which the son remains part of the father. This is also Norwegian Odin, the eternal wanderer, who according to legend does not create the world, but only plans and arranges it. Odin was also the inventor of poetry and Norse runes. The Magus holds his arms in the "coagula/solve" position - meaning "coagulate (or join) - and "dissolve." The "coagulation" is a drawing-in of energy. The "solve" is the use of the energy to dissolve, or cut like a laser. This illustrates the maxim: "As above, so below." Keys 0, 1, 3, 4, 11, & 15 share this symbolism. Coagula-Solve is a ritual gesture, called in Sanskrit a 'mudra-' part of the Alchemical process, which is in the realm of the Magus, Hermes/Mercurius. Connecting the upper and lower worlds, the Magus uses the Tree of Life as a metaphorical alembic - a chamber for containing and observing chemical reactions, and for isolating compounds. Alchemy could be called 'proto-chemistry' - it was in fact the chemistry of the Middle Ages. The word itself is of Arabic origin - like al'jibra (algebra), or al'kahal (alcohol), or al'gorism (algorhythm) - all discoveries made in the Moorish/Islamic enlightenment of Spain between 760 and 1200 AD. The process follows a simple formula. The Magus begins with the massa confusa - the base substance, the crude ingredients. They are placed in the alembic - the vas hermeticus - a sealed container. Heat is applied to the container and a series of operations are conducted on the substance to change its nature and transform it into something more precious - perhaps gold. The operations can include condensation, distillation, "repetitio," "mortificatio," and the "marriage of the king and queen." The massa confusa is equated with the rejected cornerstone of the biblical tradition. The god, or golden child, created in the end is equated with the birth of the soul. Eden Gray says the Magus reaches up to take the hand of the Creator, and reaches down to take the hand of Earthly beings, offering guidance and encouraging their evolution. He unites Spirit and Matter in Eternity. The downward hand points, particularizing, focusing, itemizing. There's the idea that the Magus is Adam, the first man, who named all of the animals. Accurately naming things is a fundamental part of the maturing process. When we can "put our finger on something," we have more control. Ambiguous, uncomfortable emotion is debilitating. Articulating (Mercury) our needs clearly gets us better results in the world, and makes it easier to deal with our own inner voices. Naming something is part of the process of creating personal goals. Names range along a continuum of certainty - when we say "the sun," or "food," everyone understands. When we say "God," or "imagination," it's not so clear what is meant. Some words are metaphors, our only tools for describing the eternal or abstract - boundaries between Chochma and Binah, where undifferentiated wisdom becomes clearly articulated. Words that give us control, and words that verbalize our lack of control are all in the realm of the Magus. Once depicted as the Juggler, the Magus also shows the artifical thought-bubble of our Human consciousness - an ability to suspend a variety of concepts simultaneously in our mind's eye (the table) - infusing mind and matter to create new things and ideas under the sun. Juggling also requires concentration, another association to this card. On the table are a cup, a rod, a sword, and a disk, representing the four magical principles - To Know, To Will, To Dare, and to Be Silent. They also represent Water, Fire, Air, and Earth, or Will, Imagination, Action, and Physical Embodiment. The disc appears only in Key 1. The pentagram, the star with five points, extrapolates our concept of "5" into geometry. FIVE is so basic to us, because of our five fingered hands. Swords appear in Keys 1, 10, and 11. Cups appear in Key 1 and Key 14. Herme's rod is used to induce or ward off slumber, and it's identical double ends show the two ways of using power - for good or for evil. Rods (or wands) appear in Key 0, Key 1, Key 7, Key 9, and Key 21. The Caduceus wand mirrors archetypal DNA/Kundalini. The Caduceus image comes from this mystifying Biblical passage: "Moses made a serpent of copper and placed it on the pole; so it was that if the serpent bit a man, he would stare at the copper serpent and live." [Num 21:9] This suggests the idea of the disease and the cure being the same thing; that snake venom is used to make snakebite antidote is only one of many examples from modern science. Magus is Mercurius of alchemy, the chameleon of elements. An infinity symbol hovers over his head, as in Key 8, Strength. In Key 21, The World, the same symbol takes the form of ribbons. The horizontal figure eight is ascribed to Hermes/Mercury, and shows dominion and mastery of the level plane - the physical world. The figure-eight over the head of the Magus is like the right and left brain, here in balance. We know now that the right half of the brain controls visual memory, spatial judgement, and verbal skills, and the left half controls logic, mathematical thought and exacting dexterity. Left brain subjects focus on logical thinking, analysis and accuracy. Right-brained subjects focus on aesthetics, feeling, and creativity. Julian Jaynes says that before the Greeks, human brains were not yet unified, and that God-concepts arose from our hearing one half of the brain as a voice from outside. The Brain was still learning about language and the ordered thought it engenders. When "consciousness," as we know it, developed, the voices in our heads became unified, and we became our own masters. The left side of the brain controls the right side of the body, and the right side of the brain controls the left side of the body. This interplay is reflected in the infinity symbol nimbus over Key 1's head, as the two sides do their dance. The Magus draws power from above, acknowledging that we are only channels or transmitters for the life force that comes from the infinite. We are allowed its use for a slice of eternity. The white cloth binding his black hair shows the limitation of ignorance by knowledge. The red roses show desire channeled into art by way of intelligence - the garden is the subconscious mind cultivated by acts of attention and the conscious mind. The roses are the desire that shapes all self-conscious activity. The white lilies represent thought undistracted by desire. The Table is the "Field of Attention." The concept of "table" carries deep symbolism. One "tabulates" data, and a chart or map is a table. We eat at a table, and eating is one of our most primary activities. The Talmud says: "Lengthen your table and lengthen your life." One way to interpret this is "Eating slowly is healthy," which most nutritionists agree is true. Another idea comes from the fact that when you have guests for dinner, you have to put leaves in the table (lengthen it) so everyone will have a place to sit. Having guests for dinner is also a healthy and life-lengthening thing to do. The objects on the table, aside from their individual significance, represent tangible creations - ideas that have taken physical form - "thoughts" that can be picked up and weighed in the hand. These are the "marks" that are referred to in the saying "making your mark." His white undergarment symbolizes wisdom, and his belt, a serpent with it's tail in it's mouth, represents eternity. Dr. Waite says "Here it indicates more especially the eternity of attainment in the spirit." The red cloak shows activity and passion, and is worn without a belt, showing that its Martian (red) nature is a choice. The Magus chooses when to take action and when to abstain from action, depending on circumstances. Another tradition holds that the Magus represents the showman, actor, market trader, and trickster. He is therefore the polar complement of the Fool, Key O. Magus is also a traveler, carrying the ambience of another world with him, teasing our curiosity, testing our wit. Magus is the Director in the Quest for Self. He is at once the potential of all opposites and the means for their reconciliation. This is the Animus, the archetypal male human, again, Adam. He loves to expound on things, he is wordy, and doesn't like to admit error. AND, he can change his mind at the drop of a hat. For a woman, the Magus is the Men in her life. For a man, The High Priestess, Key 2, is the Women in his life. All other archetypes can be said to descend from these two. The Animus is concealed by the Persona, or mask. It is a general principle in Jungian thought that inner and outer personalites are complementary: a methodical and scientific Persona usually suggests an emotional and irrational inner being. This card, connecting Binah and Keter, taps into the infinite cosmic force. It reminds us that the goal is not to depart from manifestation, but to forge an effective and enlightened oneness with the physical world. This is the Bodhisattva, who forgoes complete release into enlightenment, to stay in this world, assisting all creatures in their path to the light. Some say the Magus has successfully accomplished the union of opposites, with the four elements at his disposal. Others say he is an eternal gambler, relying on luck to achieve his ends. Mercury's placement at birth sets the character for the person's mental style. It shapes the way our minds work; it is the connection between the spirit (Sun) and the personality (Moon). Mercury infuences communication. Afflictions to Mercury commonly create misunderstandings, or mental phenomena like dislexia, speech impediments, or stuttering. Strong Mercury aspects give the native brilliance in speech, wit, writing or music. Mercury is dexterity, as best shown in Virgo; but undoubtedly many a jeweler, juggler, or surgeon has good Mercury placement. Mercury moves quickly, completing it's orbit around the Sun in 88 days. As one of the 'personal' planets, it's constant changing reflects interpersonal dynamics we see around us, and short term mood swings in ourselves and others. Mercury retrograde causes misunderstandings, false starts, lost keys, and missed opportunities. Mercury is Exalted in Aquarius, and Rules Gemini/Virgo. Mercury's detriment is Sagittarius, and its fall is Pisces. The Sepher associated with Mercury is Hod.